“The Constitution does not allow President Obama, or any President, to apprehend an American citizen, arrested on U.S. soil, and detain these citizens indefinitely without a trial. When I ran for office, I promised the people of Texas I would oppose any National Defense Authorization Act that did not explicitly prohibit the indefinite detention of U.S. citizens. Although this legislation does contain several positive provisions that I support, it does not ensure our most basic rights as American citizens are protected. While there are many egregious parts to this bill, the stripping of Americans constitutional rights, such as what is explained above, is what turns America from being the land of the free, to Police State USA subject to martial law at the president’s whim. 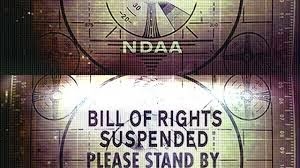 Below the video which explains how this NDAA is bigger and badder than the previous one for 2013, will be the text of the NDAA bill embedded…. for those that care and wish to prepare accordingly, I suggest you read the entire bill and learn exactly how many constitutional rights have just been stripped from you and your family.